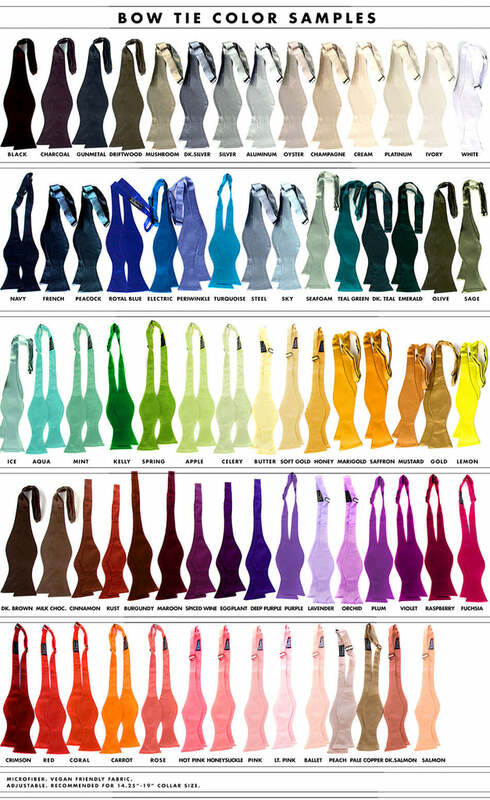 Select one from our 75 colors! Select one from our 100+ inks! Type one in from our 300+ graphics! Yes, this is where you order up customized bow ties for your whole wedding party! Up to 20% off depending on quantity! Have the most dapper groomsmen on earth? You can build a bow tie in the perfect color and design combination that's unique to the event you're planning. Please be sure you see our colors in real life by ordering swatches before you order! Ordering swatches first will provide you with sanity for the price of a cup of coffee. Custom color orders are non-refundable and non-exchangeable. Discounts apply to the same printing ink color and same design, but feel free to mix fabric colors! If you pick the same color and ink but different designs, each of the bows will be the full price of $45 even if you order 20 of them and we'll send you an invoice for the balance. Bow ties in the right color can be hard to find. We're here to help change that. Many of our designs can work on the bow tie shape, but not quite all are recommended as too much of the print will get cut off. You can see all recommended bow tie graphics here. See something else you like? Probably a few more of our regular necktie designs will work too, they just haven't made it to that bow tie guide yet. Any questions about what design and print colors work best, please don't hesitate to contact us, we're here to help! See our bow tie color chart again right here. All our bow ties are freestyle and adjustable. We only sell the “real” kind you must tie and untie yourself. No clip-ons, ever. Nope! Though our ties are photographed in natural light, monitor renditions may vary. When color matching is crucial, please use our swatch service to be sure! Each wedding bow tie is hand-screenprinted to order in the USA in our Detroit, Michigan studio.